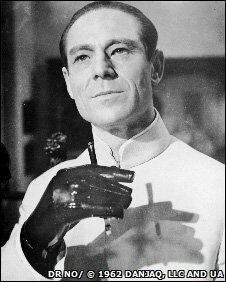 Actor Joseph Wiseman, who played villain Dr No in the first James Bond film of the same name has died aged 91, US media have reported. Wiseman, who had recently been in declining health, died at home in Manhattan, his daughter Martha said. The Canadian-born actor had starring roles on stage and screen before appearing opposite Sean Connery as the sinister Dr Julius No in the 1962 film. His last role was on Broadway in a 2001 production of Judgment At Nuremberg. Martha Wiseman told the Los Angeles Times the actor viewed his role in Dr No with "great disdain". "He was horrified in later life because that's what he was remembered for - stage acting was what he wanted to be remembered for," she said. Wiseman was born in Montreal on 15 May 1918 and moved to the United States with his family when he was a boy. He began acting as a teenager and made his Broadway debut in 1938 playing a bit part in the biographical drama Abe Lincoln In Illinois. He performed in a range of shows from Antony and Cleopatra to King Lear before hitting the big screen starring opposite Marlon Brando in 1952's Viva Zapata! and Burt Lancaster in 1960's The Unforgiven. Later in his career he made guest appearances in many US TV shows including Buck Rogers In The 25th Century, The A-Team and The Streets of San Francisco, before landing a recurring role as crime boss Manny Weisbord in drama series Crime Story. His last TV role was in an episode of Law And Order in 1996. Wiseman's second wife, the choreographer Pearl Lang, died in February. He is survived by Martha and her sister, Ruth Wiseman.